Gain an understanding of Alaska Native lifestyles, beliefs and traditions and their role in contemporary Alaska. Anchorage is an excellent place to start an exploration of Alaska Native culture. Five distinct geographic regions of Alaska shaped traditional life, and more than 20 languages hold the stories and songs of Alaska Native people. Nor are they consigned to the past; Alaska Native cultures are alive and dynamic. Dena’ina Athabascans lived here long before Europeans arrived, fishing, hunting and living in locations spread across what makes up Anchorage today. As the most populous city and a hub for business and travel in Alaska, you’ll find members of each culture living here, from coastal southeast communities and the far north, and all points in between. It’s one element helping make Anchorage Alaska’s most diverse city – and one of the most diverse cities in the country. Anchorage attracts people from across Alaska, so traditions from all over the state are gathered together in a single place. This is most evident at the Alaska Native Heritage Center. Song, dance and sport performances from each culture provide an excellent introduction to cultures separated by hundreds or even thousands of miles. Hands-on art and practical craft demonstrations take place near a wooded outdoor village site with life-sized examples of traditional buildings. You might learn a technique from a master carver in residence for the summer, overhear what an Alaska Native teen’s grandmother used in traditional remedies, or hear a story from last fall’s hunt. Rare and unique items from all over Alaska come home in the Smithsonian Arctic Studies Center at the Anchorage Museum. The gallery brings more than 600 rare or significant Alaska Native artifacts from the national museum back to Alaska. 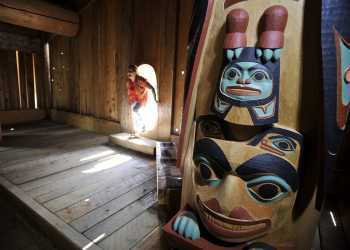 The Alaska Culture Pass grants admission to both the Alaska Native Heritage Center and the Anchorage Museum, along with a free shuttle ride connecting both. Eklutna Historical Park and the Alaska Heritage Museum at Wells Fargo each provide further opportunities to learn about Alaska Native culture. Alaska Native artists and artisans display their works at exhibitions, galleries and shops in Anchorage. You’ll find traditional masks, carvings in wood, bone and antler, and gallery-worthy hide and fiber works, but also contemporary interpretations inspired by modern Alaska Native life as well. Alaska Native art runs the gamut. The NYO Games, a competition in which Alaska schoolchildren compete in traditional Native games, takes place each spring in Anchorage. The state’s largest gathering of indigenous peoples regularly takes place in Anchorage with the Alaska Federation of Natives convention. The Charlotte Jensen Arts Market at Fur Rondy is a big draw during Alaska’s oldest winter festival.